fruinergy Cranberry Comfort ingeniously combines two superfruits: Cranberry (Vaccinum macrocarpon) and Acerola (Malpighia), both very rich in Vitamin C, with plants traditionally used in cases of urinary infections. Thyme (Thymus serpyllum) helps fighting against urinary infections. Bearberry (Arctostaphylos uva ursi) and Juniper (Juniperus communis) have properties for drainage and renal elimination. 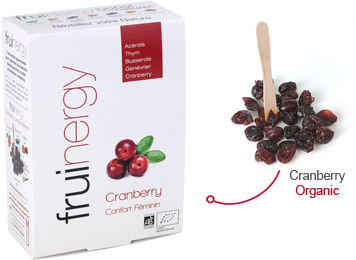 As a vitamin C source, fruinergy Cranberry Comfort contributes to the normal immune system functions. It may be recommended to women to fight urinary infections. Il peut être conseillé aux femmes pour lutter contre les infections urinaires. fruinergy Cranberry Comfort is made with environmentally friendly techniques. Its carefully selected ingredients add up to a high quality product with authentic taste.